Memorie di Angelina is a blog about the home cooking of continental Italy. But as our regular readers will know, every Columbus Day we feature an Italian-American favorite. This year our feature is the mysteriously named Chicken Scarpariello, or “Shoemaker’s Chicken”. While there is a traditional Neapolitan dish that goes by the same name, that dish is an utterly different quickly-made pasta with tomato sauce. The Italian-American Scarpariello is made with chicken, braised in wine and broth along with bell peppers, onions, garlic and—in a very Italian-American touch–oregano and pickled cherry peppers. Culinarily, it’s much closer to the Roman dish pollo coi peperoni (Chicken with Peppers). Whatever the origins of Chicken Scarpariello, it’s plenty tasty. Although there is no actual cream in it, as the sauce simmers it turns beautifully creamy. The cherry peppers melt into the sauce, lending it color and a pleasant tang. In a large Dutch oven or sauté pan, brown the chicken pieces in abundant olive oil. Remove the chicken and set the aside. then add the sausages to the pan and brown them, too. Remove the sausage and them set aside. Add the bell pepper and onions to the pan and sauté gently for a few minutes, until the onions are translucent. Add the minced garlic and let it sauté for just a few moments, then add the wine and broth. Bring the wine and broth to a simmer, then add back the chicken and sausage, along with the cherry peppers and a pinch of oregano. Cover and let simmer for 10 minutes. Then remove the lid and continue to simmer for 10-15 minutes more, or until the chicken has cooked through and the liquid has reduced into a sauce that clings to the chicken pieces. Add the chopped parsley at the last minute and serve hot. Like any classic dish, there are innumerable variations of this dish. For example, not all recipes for Chicken Scarpariello call for sausage. I think it lends a nice savory touch to the dish, though. The classic Italian-American option would be those ‘sweet’ Italian sausages with fennel seed. For today’s Chicken Scarpariello, I used the long, spiral-shaped luganega sausage—the kind I remember for New York street fairs when I was a kid—cut into lengths. In the Italian-American manner, you can serve Chicken Scarpariello with pasta as a side dish if you like. Orzo, known in Italy as risoni, is a favorite choice. And like most braised dishes, Chicken Scarpariello is even better when you can make it ahead and reheat it the next day. Bring the the liquid to a simmer, then add back the chicken and sausage, along with the cherry peppers and a pinch of oregano. Cover and let simmer for 10 minutes, then remove the lid and continue to simmer for 10-15 minutes more, or until the chicken has cooked through and the liquid has reduced into a sauce that clings to the chicken pieces. Add the minced parsley at the last minute and serve hot. Hi Frank. I love your website. Thank you for all your work. I had a couple of questions. Do you think this recipe would work in a crock pot? Do you think this dish would go well with polenta? Many thanks for any information. Well, I hesitate to give any advice on the crock pot. I do have one, but have almost never used it. On serving the dish with polenta, well, if it appeals to you, why not? Chicken and polenta is not the most common of combinations, but it does exist in Italian cookery. And anyway, polenta is a forgiving food, with a mild flavor that goes with just about anything. A couple of stupid questions: I added too much salt and I’m worried I’ve ruined it. Any tips on how to fix this problem? Also, I think I will serve it with orzo but wondering: I have only made orzo by browning it first, boiling it in chicken broth and then adding basil and parmesan near the end so its delicious but probably too much for this dish. Do you just boil it in water (ie make as directed) and serve it plain underneath? Frank – so sorry to be so behind on my comments! 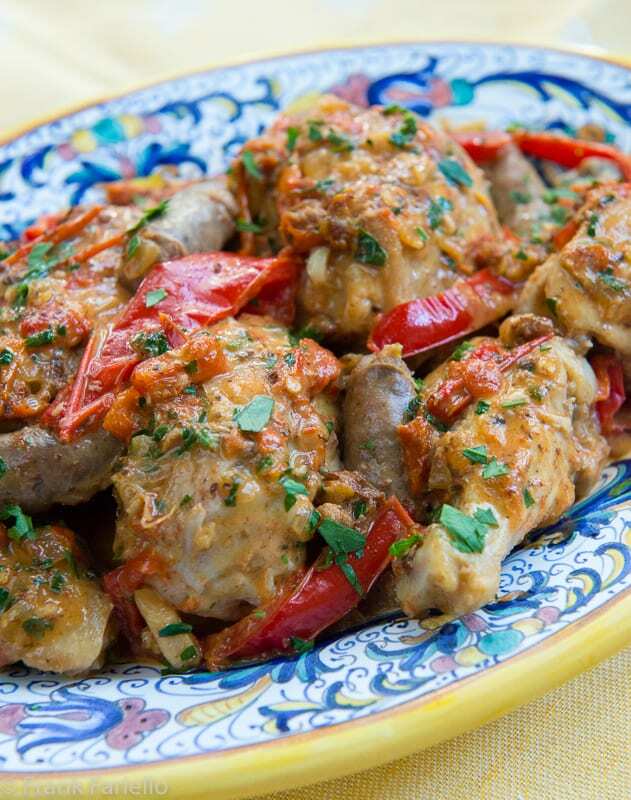 This chicken dish looks wonderful – and I have a real soft spot in my heart for Italian-American cuisine because my mother’s sister married into a wonderful immigrant family from Sicily. By the time my generation came along, the family had been there for a couple of generations and the foodways were fully Italian-American by then. It’s interesting to see how the cooking changes from generation to generation, isn’t it, David? I do count myself lucky to have been in on the first generation’s cooking. I guess I’m old fashioned that way, but I still think it was the best. This sounds wonderful, Frank! As luck would have it, I bought an organic chicken yesterday and have quite a few jars of pickled cherry peppers. (My garden was exceptionally kind this year.) Looks like I’ll be giving your recipe a try sooner rather than later. Thanks! Sounds like you’re ready to go, John! And with garden-grown cherry peppers, I bet your results will be particularly nice. If you do try it, let us know what you think. Came back to let you know … I’ve just prepared and enjoyed your recipe, Frank. This year’s cherry peppers were hotter than they’ve ever been so this dish threw some heat -and I enjoyed every bite! Chicken Scarpariello is sure to become a regular guest at my table. Thanks! Back yet again … I posted a pic of my preparation of your recipe on the Bartolini Kitchens’ Facebook page with a link back to this post. Thanks again! Looks fantastic, John! Thanks for the shout out. I have a variety of peppers that keep on giving so will be doing this over the weekend. I love a chicken-sausage combo. Our eves just got chilly enough for some comfort food – sans cream. It’s a combination that was just meant to be… enjoy! I’ve had similar recipes to this and I’ve even seen this dish in a restaurant or two, but I never knew the origins of it (love the shoemaker’s tacks and bone reference). Looks great, Frank! Thanks, Lora! Worth a try especially if you enjoy tangy tastes. I had this exact dish sometime ago but couldn’t remember the name of it. Now I know it’s an American-Italian dish! I agree this definitely makes a hearty family meal. Can’t wait to try this at my next dinner party. Thanks. Thanks, Yi! Do let us know what you and your guests think of it. I’ve eaten this dish only once, and never made it, but after seeing your photos, I am going to put this on my menu. As always, your explanations and side comments are terrific, Frank. This dish is new to me as well. The combination chicken + peppers, however, is not, as my mother used to make “pollo coi peperoni” when bell peppers were in season. I like what I see in the photo! Thanks, Simona! I love that dish, too. Perhaps surprisingly, this one actually tastes quite different, due to the pickled peppers, and the way that the wine and broth are added together at the end to create the sauce. For me, both are good in their own way. Happy to see you keeping up the Italo-American tradition of Columbus Day. Your chicken looks absolutely delicious! I love your stories and explanations. I’ve never heard of this dish but after reading your story I definitely have to make it. The ingredients are so interesting. I can’t wait to try this.Thank you Frank, another great recipe. And thanks you, Marisa Franca, for stopping by! Two types of pickled peppers, sweet and hot. Which is appropriate for this dish? Most recipes I’ve seen call for the hot ones, but either will work. Your choice. Just finished a most delicious meal. We used the Mezetta (California) Sweet Pickled Peppers. My wife is just not a fan (her loss) of heat. A very fine preparation. We used Orzo. Thanks for your dedication in bringing the taste of Italy to the World. Leftovers tomorrow. That’s fantastic, Ray. Glad you enjoyed it! Talk about memories, family dinners at our local Italian American restaurant in NJ featured Chicken Scarpariello. The cherry peppers in vinegar added just enough acidity for my taste. Wonderful post, I think I shall make it when back in the old country i.e. NJ this November. A trip down memory lane… I like it! This looks so good! I especially love the chicken and Italian sausage combo! Buona settimana anche a te, Chiara! I haven’t had this dish for years! And have never made it. Perfect way to celebrate Columbus Day — thanks! I bet your homemade version would be better than anything you’ve tried in a restaurant, John. I have never heard of chicken scarpariello, but it looks delicious. Thanks for the recipe. This looks great and will try it tonight as I have the ingredients on hand. fyi: I am assuming that the (c) is to mean ©, if so then in word, go to insert, then select symbols and scroll through the options until you find it. Yes, I’ve never heard of it either (in Montréal). Only the Italian dish of the same name. Would you have any idea where it developed? It sounds good, and easy to make. I wouldn’t add vinegar either, however a bit of lemon juice might be a nice touch. Worth a try, Christina! Personally it is not really “my kind of thing” but definitely worth a try.